Mönchengladbach – Borussia Mönchengladbach have played a sensational first half of the season, winning eight games in a row at home to set a new club record on their way to a deserved third-place berth leading into 2014. 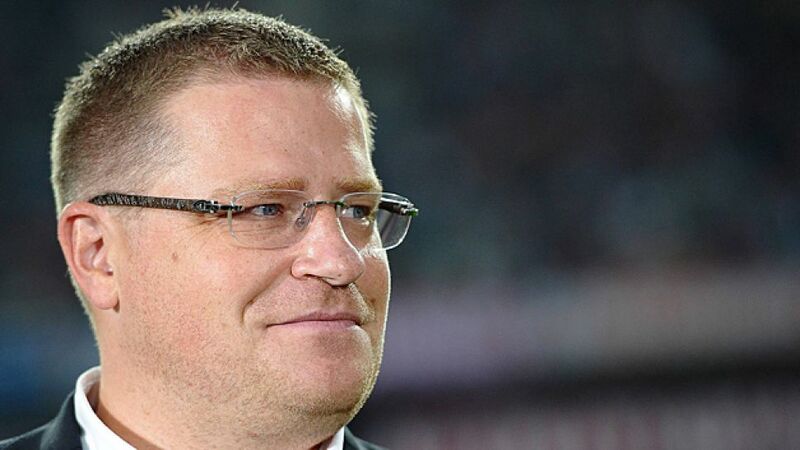 In an interview with bundesliga.com, the club's sporting director Max Eberl looks back on the first five months of the season and why he is not going to change their goal of a "top ten finish" just yet. Bundesliga.com: Herr Eberl, how would you look back on your club's first half of the season? Max Eberl: It's been absolutely positive! We've played a very good first half of the season and looked very stable. You could say that we've far exceeded our expectations. Bundesliga.com: Is this being reflected in the demand for tickets? Eberl: Even against the clubs who are not really regarded as the top clubs of the Bundesliga, we've been filling the stadium very well. If you consider that not all of the tickets which visiting fans don't buy can be reallocated to our fans, then you could say we've practically sold the stadium out for the entire first half of the season. Considering FC Bayern, HSV and Bayer 04 Leverkusen to the Borussia Park in the second half of the season, then our average is bound to increase. Bundesliga.com: Is that an added responsibility and more pressure for the second half of the campaign? Eberl: We've played a fantastic first half of the season and deserve to be in third place, but we mustn't get carried away and start dreaming. We've got to remain realistic and approach every game in the second half of the season just as seriously as we did in the first half. Bundesliga.com: Let's talk about the defence. Are achievements being given too short shrift in view of the 'Fantastic Four' in Borussia's attack? Eberl: That might be true, but it's always been the same in football that those who are scoring the goals get more attention than those who do the tackling and prevent the goals at the other end. The defence is only in the spotlight when you are conceding too much, but if you take a good look at the statistics, then you'll soon see that our defence has been one of the determining factors in our current success. Eberl: I can still remember an interview which I gave last season when I said that we had to think beyond the summer transfer window when we were planning our squad. You need two or three transfer windows if you want to build a team and with Granit, we kept on repeating – intentionally – that he was still young and needed time to get used to the Bundesliga. Not everybody would have given him this time when he was making mistakes and it's all the more spectacular the way he has emerged from this situation. In my eyes, he's one of the best players of the first half of the season. He's got great presence and assured passing and I feel pretty justified now in my claim that young players, even if they've already played at the highest level in their previous league, need time to settle in the Bundesliga. Bundesliga.com: The positive atmosphere could be dampened a little by the possible decision of Marc-Andre ter Stegen not to extend his contract. How would you rate the chances of ter Stegen remaining with Borussia beyond 2015? Eberl: I'd like to say one thing first: should Marc leave us, then that's only normal in professional football. Marc would just be the latest player to leave Borussia for one of the world's top clubs. That's nothing extraordinary. There is only one club in Germany who do not have to adhere to these rules and that's FC Bayern München. Even Borussia Dortmund, who have won the Bundesliga twice in recent years, have had to accept losing players like Kagawa, Götze and probably also Lewandowski. That's why talking about a 'worst-case scenario' is anything but the way things are. Even without Marc, we would carry on undeterred. Bundesliga.com: Have you already looked around for an alternative? Eberl: Of course we would be far happier if we could keep this team, which is developing so well, together, and we hope to be able to do that even in this case, but like always when it comes to continuity in the squad, we've got to have alternatives in mind. Bundesliga.com: Could there be changes to the squad over the winter, such as Luuk de Jong or Peniel Mlapa? Eberl: We showed in previous years how we prefer to keep our squad stable during the season. Our squad is high in quality, but not so much in terms of numbers, and the injury misfortune we had during the first half of the season showed how quickly things can get tight, but how at the same time, that gives other players the chance to shine. The best example is Julian Krob. Fortunately, we've not had any such concerns in attack, but there's never any guarantee for it staying like that, which is why we need more alternatives. Of course I can understand that Luuk and Peniel had other expectations for this season, which is perfectly legitimate. If an interesting offer comes in for either of them, then we will look into it and consider alternatives, but our priority has got to be the best for Borussia and we can only play a strong second half of the season if we've got a well-balanced squad. Bundesliga.com: Could Kevin de Bruyne of Chelsea FC be one of these alternatives? Eberl: It's perfectly legitimate to be linked with certain names, and Kevin De Bryne is a world-class player who is not getting a game right now for Chelsea, and he needs to be playing in view of the World Cup. But there's nothing else to say on that right now. Bundesliga.com: There is maybe more to be said about your plans to extend the contract of coach Lucien Favre, though. How do you rate the chances? Eberl: It's surprised me how much has been made of a simple remark that we want to extend the contract of our most important employee who is doing a fantastic job. It's anything but a surprise and only the opposite would be worthy of any headlines. Lucien Favre and I have been furthering our plans for next summer during the winter break and of course we have been talking about his contract beyond 2015. However, it could be a matter of weeks or months rather than days before a decision is reached. Bundesliga.com: To what extent are your thoughts for next season revolving around a potential extra burden of European football? Eberl: European football? Well that would be nice for sure! But that's not something I'm currently considering. I think that we did a good job last season when we qualified by total surprise. We intentionally didn't do anything crazy back then and we're not going to do that in the future either, regardless of whether we're involved in two or three competitions next season.